If you are looking for something a little different and like to keep an eye on the time then the Ring Clock might be for you. The Ring Clock is a three-band rotating ring watch lit with LED lights and invented by Gusztav Szikszai of Hungary. He wanted to create a unique timepiece that was a "conversation ice breaker". Launched in 2013 with a successful Indiegogo crowdfunding campaign the Rink Clock is a waterproof watch that fits on your finger. It does look cool and I am sure it will start a few conversations but how does it work and is it worth its $399 US price tag. I will take a further look with my Ring Clock Three-band Rotating Ring Watch Review. The Ring Clock is made from a surgical grade, allergy-free stainless steel and has three bands with LED lights that indicate the time; hours, minutes, and seconds. The lights do not remain on at all times. 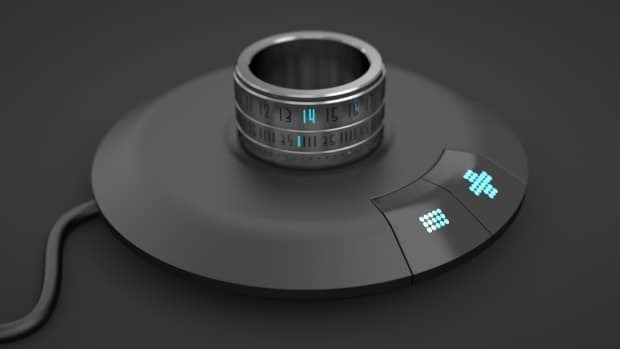 The ring has two sensors that when you rotate the ring on your finger the lights turn on for 15 seconds. When the battery is low it will remain on for only 5 seconds to conserve battery life. The display lights a are bright and can be seen in a variety of light conditions but in bright direct sunlight, you will need to cast a shadow on the ring to be able to tell the time. The size is much bulkier than a typical ring. The ring is rather big and masculine looking. I can't see many women wearing this ring. Since this is a precision timepiece it needs to be durable to continue to operate correctly. Along with being made from stainless steel, the Ring Watch is waterproof. A good idea since your hands do get wet from time to time. To keep this watch running set the ring on the wireless charging pad provided and wirelessly charge the onboard battery. It takes two hours to charge and will last about a week of normal use. Max. 2 hours. Do not charge the ring continuously for days, because it will ruin the battery! Charging time: max. 2 hours Do not charge the ring continuously for days, because it ruins the battery! The ring watch is a cool idea but the price is pretty steep. The price started out at $195 and went up to $399. They seemed to have a few delays from the start. I read a number of reviews and there were complaints that it took almost two years to receive their product after the crowdfunding campaign. Battery charging issues seem to be a big problem with with a number of customers complaining the battery does not hold a charge after a few months. Not sure if they will add any satellite services anywhere else but for any service or to change the battery you have to send it back to the factory in Hungary. If you want a conversation starter I do believe the Ring Watch will do that for you. I think the Ring Watch is definitely a feat of engineering and has a coolness factor of 10. It is a specialty item that will appeal to only a certain person most likely a man. I can't see the Ring Clock becoming too popular, especially at the price being offered and the reliability that is being reported. I think it needs a little more refinement and reliability to be worth the price. If you want more then to just tell the time I think there are better options available. Here are a few smart rings clocks that are also smart and much less expensive.